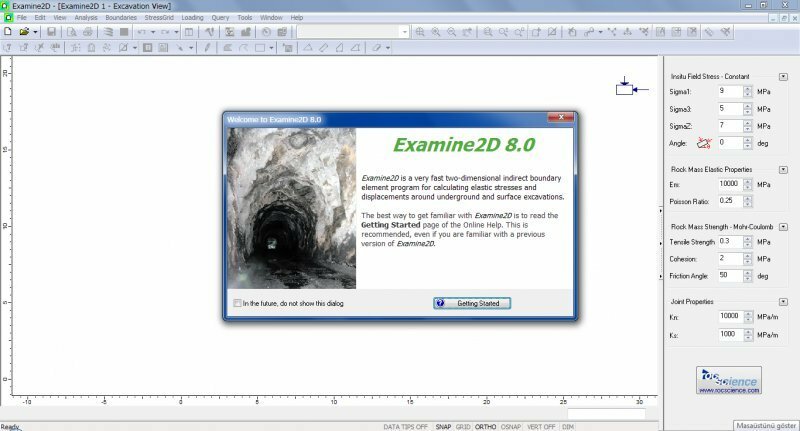 Examine2D is a very fast two-dimensional indirect boundary element program for calculating stresses and displacements around underground and surface excavations in rock. Unlike the Finite Element and Finite Difference methods, the boundary element method only requires meshing around the excavation boundaries, eliminating the need for complex volume mesh generation. Examine2D provides an integrated graphical environment for data entry and visualization. A CAD based modeler allows for point and click geometry input and editing. Popup windows allow for easy entry and modification of model parameters. The simple editing tools provide a convenient method for performing parametric studies. The graphical data interpreter offers a rich set of tools for the convenient display of model results. With Examine2D you can quickly create and mesh a model, perform a stress analysis, and interpret the results. * Examine2D download link provides free for non-commercial use version of the software. Fachwerk is aimed at structural engineers who analyse and design reinforced concrete structures. UGTANK. xls workbook is for the analysis and design of anchorage for underground storage tanks, obviously addressing the concerns of buoyancy. Examine2D has been rated 3.0 out of 5 points. A total of 2 votes cast and 0 users reviewed the software.